We are women and men, children and youth. We come together as seekers, as learners and as teachers. We are single, married, divorced, widowed, with families and without families. We are straight, gay, lesbian, bisexual, transgender and questioning people. We know life’s ups and downs and recognize that we all find ourselves in difficult situations at various times in our lives. We value unity over uniformity. We thirst for justice, and we long for peace. We welcome the wisdom of all. All are welcome, all are included, all are beloved in our Holy Wisdom Community. MISSION STATEMENT: We are Holy Wisdom Inclusive Catholic Community. We Joyfully embrace and live the gospel message of Jesus with deeply rooted love. GOVERNANCE: In addition to weekly masses, members of the community participate in decision making at monthly community meetings where they share information, discuss issues and develop ideas. These meetings take place every month, except December, from September through May. 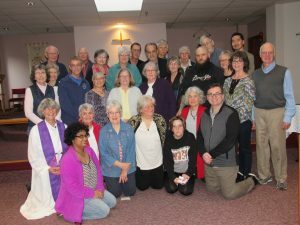 People new to Holy Wisdom are always welcome to join these gatherings and participate fully in the life of the community. FINANCIAL SUPPORT: Holy Wisdom Inclusive Catholic Community is a non-profit organization. From the beginning of our community gatherings, members have suggested that a portion of our collected donations be given to those in need. This led to a decision that a percentage of what we collect will be given to the ministries and organizations that we, as a community, wish to support. Currently the community donates 8 percent of the collection. 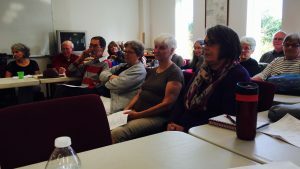 Decisions about which ministries will receive donations from Holy Wisdom are made at community meetings with input from members of the community. Checks can be made out to Holy Wisdom ICC and sent to MJ’s Accounting 4616 16th Ave. Lacey, WA 98503. All donations are tax-deductible. Donations may also be made through direct deposit. Contact MJ at mjacctng@yahoo.com for more information.